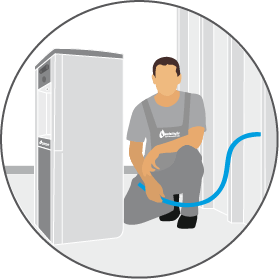 With technicians that are trained under the WQA’s strict guidelines, our installation process is simple, seamless and quickly connects you to an endless supply of fresh drinking water. 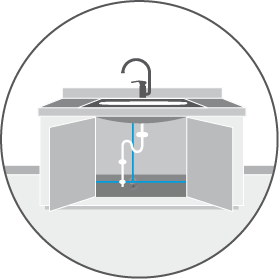 We start by finding the nearest cold water source within your building. It’s usually located under a sink. We install a “T” fitting. 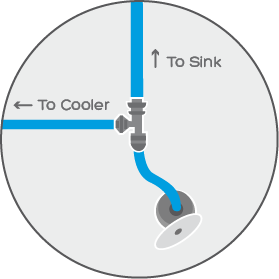 We install a “T” fitting that allows the sink and the cooler to share the same line at once, therefore connecting you directly to your existing water supply. We run the line where you need it. Then, we attach our food grade waterway to the “T.” A small hole is cut in the back of the cabinet, and we “snake” our waterway inside the wall and to the ceiling. 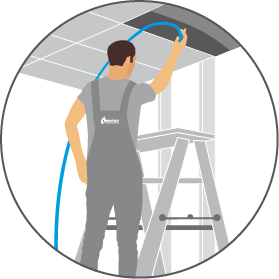 Once it’s above the ceiling, it’s easy to run it anywhere that you need your water cooler. We cover with a cable plate. Once we get the waterway above the cooler, we “snake” it back down the wall and out a small hole that is covered with a cable plate, leaving a seamless installation. Finally, we plug in the bottleless water cooler and turn on the water. You are now ready to enjoy an endless stream of fresh water.